Handy Backup is the perfect MySQL backup software. It allows creating non-blocking snapshots of data, which are taken without interrupting SQL transactions. With scheduling, an ability to roll back a database to any point in time, and other features Handy Backup is often considered one of the best MySQL backup solutions for Windows and Linux. Cold backup suggests stopping the server, ensuring that all cached data is saved, and then copying binary files. As a general rule, this method should not be used, because server downtime usually results in lost productivity and revenues. Hot backup is a more sophisticated approach which lets you take live (online) MySQL snapshots while the database is queried or updated. It is performed on logical level using MySQL interfaces rather than HDD files. 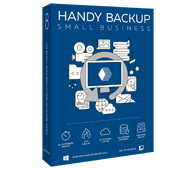 Handy Backup uses hot backup technology, similar to the one employed in MySQL Enterprise Backup (Oracle’s proprietary software for enterprise editions of MySQL). It works quickly and allows creating automatic backup for particular tables, tablespaces, and entire databases. To recover database after a data loss event or a server failure. To migrate from MySQL to other databases (read about the MySQL Backup plug-in below). To set up replication servers (either in master-to-master, or master-to-slave configurations). To create a copy of a base that you can use for experiments. Recovery operations work equally for MySQL backup Linux or Windows versions. To learn more, please refer to MySQL recovery. Handy Backup features a powerful MySQL backup that acts like a MySQL client and retrieves data without interrupting the server. Backing up MySQL with Handy Backup doesn’t require to install any additional software. The program is equipped with all plug-ins that can be used during the trial period. You only need to find MySQL in the list, and click Add to select it. The MySQL Backup option connects to the server and backs up database contents into a dump file. The resulting backup file contains all SQL queries required to reproduce the original database including all tables, tablespaces, stored procedures, functions, and other data. Note: You can also use MySQL backup Linux options from Windows by providing a server IP or name to connect it from Windows version of Handy Backup. To backup MySQL database Linux remote servers provide full access to its data. The use of advanced hot backup technology lets you protect data without interrupting your web applications and website services! The featured utility can back up the entire database as a whole, or copy any selected database tables. Save time and space of backup by copying only just you need! Make automatic MySQL backup with all options in a single program, instead of creating a complex MySQL backup script for Linux shells or a Windows batch file. You can back up MySQL database stored not only on your local machine, but on any remote computer on the network, effectively replacing remote MySQL backup command in Linux and Windows. Backup MySQL to Google Drive, Dropbox, to Amazon S3 or to another popular cloud, using either a dedicated cloud plug-in or a WebDAV access. Another option is the dedicated HBdrive cloud for backups. Make copies with Handy Backup and then process these copies with any software you wish to apply, as Handy Backup does not change format or attributes of data it backs up. To learn about other things you can do to your MySQL database with Handy Backup, please see MySQL Automatic Backup. In addition to the plug-in described above, our software also has a general Database Backup plug-in that can be used to export tables through ODBC connectivity. This plug-in lacks support for certain MySQL objects (e.g. stored routines) and requires you to install ODBC Driver for MySQL which you can download from the official MySQL website. To learn more about this plug-in, please refer to ODBC backup. Note that it is primarily the MySQL backup tool for Windows. Handy Backup is a reliable MySQL backup tool that enables you to completely automate everything related to protection of your databases, websites and MySQL-driven applications! The idea of replication implies that you share database contents between multiple physical or virtual MySQL servers (nodes), in order to improve your application’s performance, security, and other critical parameters. To a certain extent, replication resembles clustering: if one node crashes, this doesn’t lead to failure of the entire website or application. While replication is a good security measure, it is important to understand that it can’t replace backups. Since it is usually performed in real time, dropping (deleting) a database on master server will repeat the same operation on slave servers, resulting in loss of data. The same is valid for MySQL mirroring, which is simply another name for master-to-master replication. 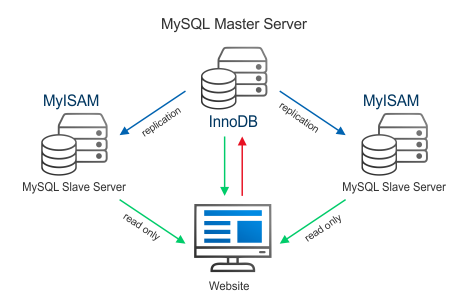 MySQL replication requires copying master database to different servers, and configuring these servers to act as MySQL Slaves. Download and install Handy Backup. Using the MySQL Backup plug-in, create a backup of the database you want to replicate. An advice: You can use online backup on this step, for example, making a MySQL backup to S3 from Amazon. This allows you having an access to a copy from any point of the world! In each backup file change MySQL storage engine to MyISAM. Since the backups are created in a very understandable form, you can do it with any text editor by changing CREATE TABLE statements in the beginning of each file. Note: Changing storage engine is a general recommendation for any master-to-slave replication configuration. MySQL Slave servers are supposed to be read-only, and setting MyISAM as a storage engine greatly improves their performance. Restore modified backup files to MySQL Slave servers. For each Slave server, set a unique server-id parameter, and then use the CHANGE MASTER TO statement to set up communication with the MySQL Master server. For more details on replication and setting up combination of replication and backup, please refer to MySQL replication. Version 8.0.0, built on 4 March, 2019. 104 MB Backup Software from Novosoft LLC. 249 USD per license. To back up and restore your MySQL databases, you need to use the Handy Backup Small Server edition. Free 30-days trial version! The MySQL backup feature is available in two editions of Handy Backup: Small Server and Server Network. Both editions are equipped with full sets of features, the only difference is that the Small Server edition is designed to back up one computer, while the Server Network edition enables you to back up several servers on the network. If you are looking solely for a MySQL backup solution, then Handy Backup Small Server will serve you the best. If you want to back up multiple workstations or servers, then you need Handy Backup Server Network. We are open for cooperation with business partners from all fields of IT industry, including OEM, technological integrators, service providers, and other. Partnership details are discussed individually, in respect of each partner’s resources and expertise. As regards MySQL backup, Handy Backup solutions are already employed by a number of web hosting providers who use it to back up client websites and databases. If you would like to join our partner network or learn more about how we can help your business, please visit the Partners section. MySQL backup speed is great. For MySQL is Excellent, Super Fast, Super Easy! For now we are planning to recommend Handy Backup to our customers. It`s nice Handy Backup can do Windows back up, as well as Outlook Mail. Great backup software. Has been using this application for years now. So I can back up a part of data, right? MySQL backup is possible with Handy Backup.